I've been meaning to write this post for about a year now. In January of 2013 Brendan Brazier launched a free online program called “Thrive Forward”. At that time I’d been plant based for just less than six months and wasn't familiar with Brendan, but I kept seeing his name and the program popping up on blogs. The program is a series of videos, articles, and recipes that outline Brendan’s version of plant based eating. Over the last year it has expanded, and they've added a Sports Edition and now a bonus Thrive Kitchen section. I quickly decided to buy two of Brendan’s books to dig deeper into his food philosophy. I learned a lot about nutrition in general from doing the program and it helped me make the shift from what I like to call a “substitute” vegan to being a plant based eater. “Substitute” vegans are the ones who like to substitute their favorite meat/dairy foods with vegan versions (ex. A pizza with seitan pepperoni and vegan shredded cheese). There’s not necessarily anything wrong with that, but my aim has always been to be as healthy as possible and I don’t think that’s the right way to do it. I do think that substituting is essential for anyone transitioning to a plant based diet because it’s hard to get over the messages we've been ingrained with and the food traditions to which we are attached. I love the Thrive program because it’s all about being as healthy as possible and is super focused on whole foods. It also emphasizes mindful eating principles and not counting calories. This was the hardest thing for me to adjust to about the Thrive program because I was convinced that I needed to do that to maintain my weight. I put my trust in what Brendan had to say and stopped counting calories. I’m happy to report that as of my latest check up last week I weigh 148 pounds, 2 less than I was expecting! I don’t only use Thrive recipes, but the general program has become a part of my routine. My “smoothie for breakfast, salad for lunch” philosophy stems directly from Thrive. I always have a batch of homemade energy bars in the freezer based on Brendan’s formula. I try to follow his principles about how to use nutrition to refuel after a workout, and the bars are my go to in the morning after my shower before my commute. 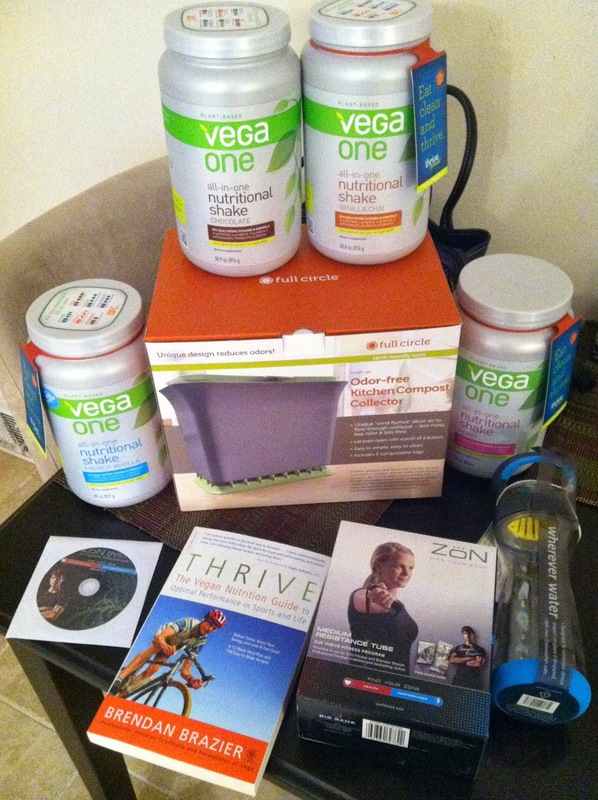 I was lucky enough during the initial Thrive program to win an amazing Vega prize pack with (among other things) 4 giant tubs of protein powder and a case of coconut water. I am still making my way through the last of the powder, and in case you’re curious my favorite flavor Is Vanilla Chai. I use the powder in my smoothies, my bars, other baked goods, and oatmeal. In terms of recipes, I've used his burgers and pizzas a lot. I’m recently trying to limit my gluten intake and many of his recipes do the same. I don’t eat quite as much fat as he uses in his recipes because I’m still not convinced that a super high or super low fat diet is ideal. In terms of athletic performance, I learned a lot from his books and the online program. His “Thrive Fitness” book has training logs and a specific workout plan that I followed when we were still in NC and I had gym access. It taught me a lot about using my workout time wisely/effectively and about keeping track of my workouts to monitor gains and/or problem areas. I am certain that my strength and cardiovascular endurance were both improved significantly because of his program. I cannot make it any more clear that Thrive is an amazing free resource for anyone on a plant based diet, anyone who is plant curious, anyone who is an athlete, and anyone who wants to learn more about nutrition from a non-mainstream (aka non-shady funded) source. And in case you’re curious, I wrote this review/post solely of my own volition because I think it’s awesome!